Information: After “Rocket” won the Rainhill Trials in 1829 the future of railway steam technology was entrenched for many years to come. Innovations in design continued to keep pace with increased demand, but one negative of steam propulsion could not be ignored; the safety aspects of steam locomotives in confined areas such as tunnels. The earliest practical solution to over-come this problem came in the form of over-head electrical propulsion. By 1895, a 675-Volt DC was devised by General Electric for working the 1-1/4mile Howard Street tunnel adjacent to the new passenger railway terminal in Baltimore, Maryland in the United States. Details: Ordinarily a free-lance design for a model doesn’t garner much attention by model enthusiasts or collectors. In researching a viable prototype for the Tri-ang Railways Steeple-cab, research led to the strong resemblance of the model to the prototype of all over-head electric propulsion to follow. 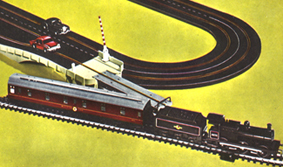 Three Bo-Bo articulated locomotive sets were built for hauling passenger trains, complete with non-fired steam locomotives into the terminal station in Baltimore. The locomotives were extremely heavy for their size, weighing in at 87-tons but were none-the-less admirable performers and of course took care of the danger of steam operation in tunnels once and for-all. Technology quickly developed to replace these pioneering locomotives and by 1912 a three rail system was adopted making the over-head locomotives redundant. The success of the Baltimore & Ohio Railroad’s project was quickly put to use in other parts of the world. Today over-head electric propulsion is the preferred method of railway technology particularly in many continental European countries, such as Switzerland. The steeple cab, introduced alongside two other Transcontinental models was introduced to the Tri-ang Railways range in 1959, along with the first generation catenary system. All three models were aimed at International markets with hopes of a wide market appeal. Like the pioneer electric locomotive, none had long production lives with the steeple cab being with-drawn from the range in 1963 after 15,000 models had been produced in various colour schemes.